As was blogged before, we (i.e. Pixelpark) are supporting a german academy for fire workers (i.e. Landesfeuerwehrschule Hamburg) for simulations in Second Life. This academy is running trainings in SL on the Pixelpark Islands. Simulations can be considered a subset of serious games in my definition. An advanced and very much tough through simulation was created by swiss projects. They developed a simulation room that resembles a kitchen where a meal is prepared. 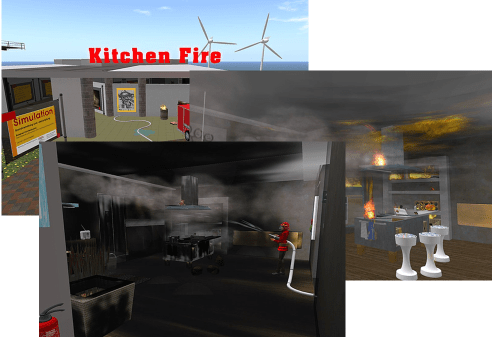 After some time there is a fire starting in the kitchen – a typical situation that fire workers encounter. Now it’s your turn: you have to put out the fire, of course but how? The nice thing about this implementation of the fire is that it behaves realistic i.e. different regarding to what you do; the simulation is very detailed in terms of that you have to be careful. There are several conditions that make things worse instead of better – but why not try out yourself? Check out the great image stream that Carina Raymaker prepared for a preview or go inworld and check out the simulation yourself. Here is a corresponding swiss-projects blog entry (german). Good job, guys! PS: thank goes out again to Carina Raymaker from the SL group Deutsche Mentoren (their blog in german) for risking her avatars life (I think) to document this in pictures. [EDIT] Here is the corresponding full description (german) from her. This entry was posted on Saturday, May 9th, 2009 at 6:06 pm and is filed under Second Life, Serious Games. You can follow any responses to this entry through the RSS 2.0 feed. You can leave a response, or trackback from your own site.